Holy Trinity is located just outside the CBD, opposite the beautiful Fitzroy gardens, making it ideally suited for those choosing to marry in the city. A wedding is a joyful time filled with anticipation and excitement for your future together. It is also one filled with many decisions and requires a lot of planning. The following information will let you know what to expect both in the lead up and on your wedding day. 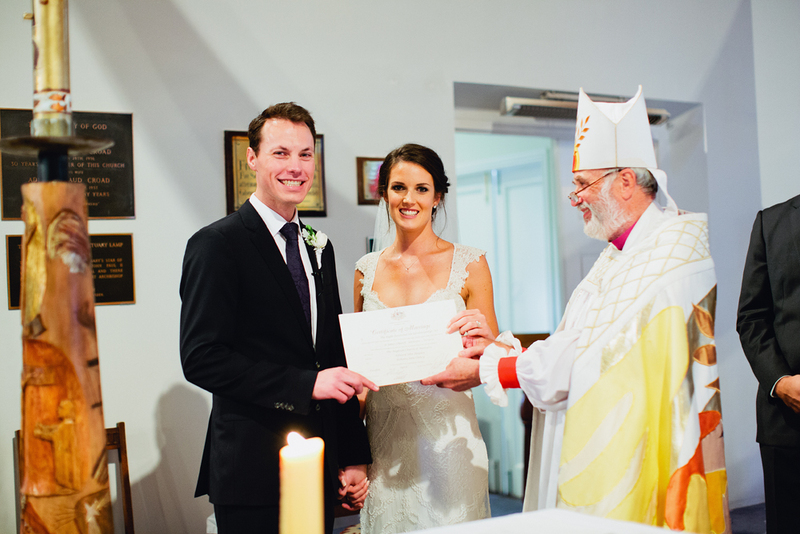 Once you have decided that you wish to be married at Holy Trinity, we organise a meeting to get to know one another and prepare the required legal documentation. At this stage we require a deposit of $250* to guarantee the date of your choosing. You will both need to bring your passport and an original birth certificate to this meeting. If you have been divorced, you will need to bring evidence of this. This paperwork is required so the Vicar can lodge an application to the Bishop for permission to conduct this marriage. You will also be encouraged to attend a Marriage Preparation course. Most couples find this a useful time to reflect on their relationship and future together. You will be supplied with the various materials and contact details to arrange this. Closer to your wedding, we will meet to discuss your order of service (see below for template). This is the booklet that is handed out to your guests. Weddings at Holy Trinity use the Anglican Rite of Marriage as a basis, and you will choose your own readings and music. Once you have finished, send your order of service to the Vicar for approval then you’re ready to finalise and print it for your big day. An organist will be available on the day, alternatively you can bring music to be played from a CD. In the weeks leading up to your wedding, we organise a full rehearsal with you and your bridal party. This helps iron out any nerves and lets everyone know what to expect on the day of the wedding. On the day of your wedding flowers will be provided and everything will be taken care of. All there is left to do is enjoy your big day! If you have any questions please do not hesitate to contact the Vicar on 9417 3341. Click here to download a template order of service booklet. Note this is a full service version, you are not required to give this version to guests; this version is for the Vicar. This has been designed to print at correct size onto A4. *A deposit of $250 secures the booking for you, however if the wedding is cancelled within three months of the set date the deposit is non-refundable. Please bring this cheque addressed to Holy Trinity Anglican Church. Do we need to be Anglican to be married at Holy Trinity? One or both of you need to identify as Anglican. You will need to bring appropriate documentation to confirm this, such as a certificate of baptism and/or conformation. What costs are involved with getting married at Holy Trinity?